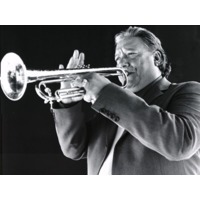 Arturo Sandoval (born November 6, 1949) is a jazz trumpeter and pianist. He was born in Artemisa, in the newest renamed Artemisa Province, Cuba. Sandoval, while still in Cuba, was influenced by jazz legends Charlie Parker, Clifford Brown, and Dizzy Gillespie, finally meeting Dizzy later in 1977. Gillespie promptly became a mentor and colleague, playing with Arturo in concerts in Europe and Cuba and later featuring him in The United Nations Orchestra. Sandoval defected to the United States of America in Spain, while touring with Gillespie in 1990, and became a naturalized citizen in 1999. Sandoval's life was the subject of the 2000 TV film For Love or Country: The Arturo Sandoval Story, starring Andy García. He currently resides in Calabasas, California.